The 2018 Key Metrics for Philanthropy-Serving Organizations report provides comprehensive benchmarking data and analyses on the governance, finances, membership, services and programs, and operations of regional and national philanthropy-serving organizations (PSOs). The 2018 Key Metrics for Philanthropy-Serving Organizations report provides comprehensive benchmarking data and analyses on the finances, membership, services and programs, operations, and governance of regional and national philanthropy-serving organizations (PSOs). The full report is accessible to our members. United Philanthropy Forum’s 2018 Compensation & Benefits for Philanthropy-Serving Organizations report provides comprehensive benchmarking data and analyses on regional and national PSOs’ employment practices, based on the responses of 55 PSOs. This report highlights key areas of progress for the Forum’s PolicyWorks initiative during its first nine years, based on the responses of 32 regional PSOs. It documents some dramatic gains in regional PSOs’ capacity to engage in government relations, advocacy and public policy work, and the critical role that the Forum has played in directly supporting this growth. 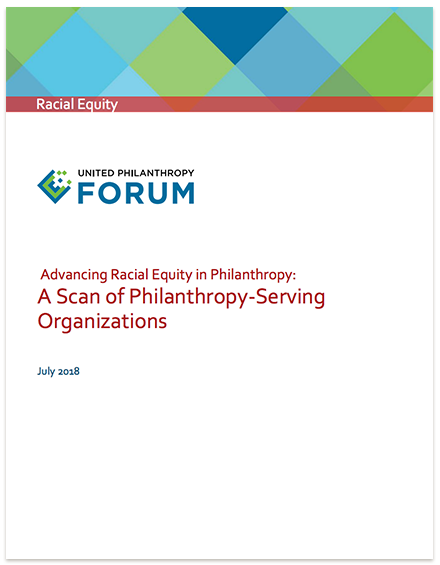 United Philanthropy Forum conducted a scan of regional and national philanthropy-serving organizations (PSOs) in February through May 2018 to get a more comprehensive understanding of PSOs’ current work and future needs to advance racial equity in philanthropy. The scan involved both a survey that asked about PSOs’ current work, future needs and greatest challenges in advancing racial equity, plus in-depth interviews to discuss what it takes to do this work effectively and to identify their key challenges, barriers and opportunities for addressing systemic inequities. This December 2017 edition of the Forum Policy Playbook focuses on the upcoming 2018 PolicyWorks Institute and Foundations on the Hill schedule for March 11-14 in Washington, DC. We look at why you and your members should attend; what you need to know to encourage your member’s engagement and your PSO team’s involvement; provide tips on how to organize and plan; and offer Forum member resources to help guide your efforts. Our first-ever 2017 Key Metrics for Philanthropy-Serving Organizations report provides comprehensive benchmarking data and analyses on the governance, finances, membership, services and programs, and operations of regional and national philanthropy-serving organizations (PSOs). Our first-ever 2017 Key Metrics for Philanthropy-Serving Organizations report provides comprehensive benchmarking data and analyses on the finances, membership, services and programs, operations, and governance of regional and national philanthropy-serving organizations (PSOs). The full report is accessible to our members. The November 2017 edition of the Forum Policy Playbook focuses on taking policy positions and creating a legislative agenda. We look at the common traits of successful legislative agendas; comment on the benefits of having a process in place to consider expedited approval of policy positions; and share samples from members that are engaging in this work.